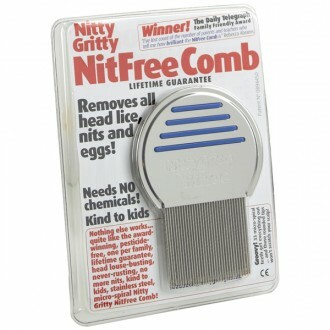 Nitty Gritty Nitfree Comb: This comb is one of the most effective ways of removing and destroying head lice, nits and eggs. 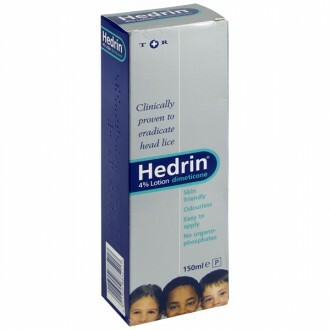 It is easy to use and can quickly and effectively remove lice in a chemical free manner. The microgrooved steel teeth dig into the hair and get rid of all traces of lice without causing any damage to the scalp. The Nitty Gritty Nitfree Comb: using the nitty gritty comb is an extremely effective way of clearing hair of nits, head lice and eggs without using chemicals. The comb consists of microgrooved steel teeth which, without damaging the scalp, can rid the hair of all of these unwanted infections, without cutting or pulling at the hair. While at a glance, the 33 round-tipped teeth may appear somewhat rusty, this is simply due to the manufacturing process and in no way affects the success of this nit comb. Designed to have no sharp edges, the nitty gritty comb glides easily through the hair. Once the head lice are removed, you must also remove the empty hatched egg shells (nits) and also the unhatched lice (eggs), to be sure that you have indeed eliminated the problem. It was a group of mothers who designed the nitty gritty comb, as they didn’t want to use chemicals on their children’s hair. Simple but elegant, this award-winning comb works by the micro-spiral grooves removing anything which has fixed to the hair, doing an amazing job every time. It’s a small, elegant item which does something quickly and easily and, needing no batteries, this advanced design uses old-fashioned common sense. It arrives with a guarantee that, if you are not happy with the nitty gritty comb, you can have a full refund at any time. The action of the micro-spiral grooves of the nitty gritty comb is to slide through hair on which the Nitty Gritty solution or some hair conditioner has been applied, easing the hold that the lice, nits or eggs had on the hair. This method of freeing hair of such an infection has the support of two million ‘NitFree’ UK families, who no longer use any other method on their children’s hair. The Nitty Gritty NitFree comb is a user-friendly product, with no sharp edges and no attachments. Its tempered steel construction makes it very easy to look after and so the comb can be used by all members of the family. The non-slip handle makes it easy to hold in the bath or shower and the special stainless steel guarantees it won’t tarnish or rust. The carefully-calculated gap which separates the teeth from one another is smaller than even the tiniest nit, meaning that nothing will pass through these gaps when it is being moved through the hair. The long teeth also make it easy to pass the nitty gritty comb through longer hair, making the procedure quicker and reliable. When combing through the hair, the 33 teeth are separated by a gap which is close enough together to prevent any lice, nits or eggs escaping the process. The tip of each tooth has a rounded end, which means that scratching or hurting the scalp will not happen. As the design makes the comb easy to clean after use, it can be used by all members of the family. This comb can be used alongside other treatments, if so desired. Microgrooved teeth: this means that the teeth have microscopic cutting edges in a tight spiral form along their whole length and the dragging movement through the hair removes the smallest of items. When used as directed, this unique design has a lifetime guarantee. Using the Nitty Gritty comb is a pesticide-free treatment, which can be bought as a full kit, to also include nitty gritty solution and a defence spray. As recommend by Jonathon Ross to Emma Thompson on Radio 2. Wet your hair and then apply plenty of hair conditioner. Divide the hair into various sections and comb through every section. Ensure each section is clear before you move on to the next. Need to know more about Head Lice?